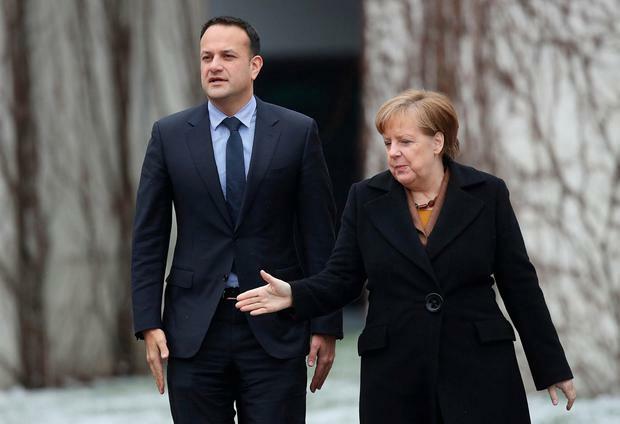 TAOISEACH Leo Varadkar will meet French President Emmanuel Macron and German Chancellor Angela Merkel next week as the massive uncertainty over Brexit continues. The main focus of the talks will be the latest Brexit developments and no-deal planning will also be on the agenda given the continuing chaos in Westminster. British Prime Minister will make a renewed bid to get her Withdrawal Agreement through the House of Commons today but this is widely expected to fail. Mr Varadkar will travel to Paris on Tuesday to meet Mr Macron. Mrs Merkel will visit Dublin on Thursday. Mr Varadkar said: “Both leaders have been strong and consistent allies of Ireland in responding to the unique challenges we face from Brexit. “I will again express the Government’s gratitude for their continuing solidarity. Meanwhile, former President Mary McAleese has said Brexit provides an opportunity for a re-calibration of the Irish unity debate. Dr McAleese paid tribute to former Taoiseach Enda Kenny’s securing of an agreement among European leaders post-Brexit that dictates should partition end Northern Ireland will be able to be seamlessly re-enveloped into the European Union. That was a “gift” and a resource to be built on she told a DCU Brexit event. “Now what you are offering people is not – as some people fear – absorption into the Republic where people will be preening themselves because now past injustices have been righted – but rather what you will be offering people is the prospect of this wonderful new democracy within the European Union fresh and different and reconciling of all identities – something really qualitatively different,” she said. “It’s where we have always wanted to get to. It’s what many of us have always wanted to construct but actually Brexit has given us a tool that we never really expected to have – and I think we should use that very, very wisely,” she continued. A referendum on Irish unity was “on a horizon” but the “when of it” is not known, she told attendees amid warnings that the groundwork must be laid so that any vote on ending partition does not have the same divisive consequences as the Brexit referendum did for the UK. There would be a need for issues to be tackled by scholars and by civic society in order to lay the bedrock for a referendum she said. In Northern Ireland there is a feeling that the debate has been nudged onto a new trajectory and away from the “wrap the green flag around me trajectory” and “into a much, much healthier space with a focus on what a shared future might look like,” Dr McAleese said. Amid the ongoing turmoil in London stalemate the former president gave a pithy assessment of the current state of play when she said the title of her speech was “haven’t a clue”, which she commented was “roughly where we’re at”. Brexit was the political equivalent of necrotising fasciitis (flesh eating bacteria) she said. But while politics has been in the way of securing a Brexit deal Dr McAleese said the process is not yet at the moment of closure when “reality breaks through the bluster”. She also described the efforts of the Irish government and the EU as showing a “laudable farsightedness and a clear-sightedness”. Reflecting on both the genesis of Europe, of Ireland’s membership and the decision of the UK to leave Dr McAleese pointed out that Ireland knows of the centuries long shelf life of “immensely disruptive decisions”, citing plantation and partition. “Westminster has watched in surprise as those two overlooked hens have come home to roost very lively on the perches at Westminster,” she said. She was also very critical of the “ignorance” displayed by some in the UK about Ireland and the issues relating to Northern Ireland, which she said has been worsened by the absence of nationalist voices in Westminster.